Hobbs Woods – Located about 3 miles south of Fond du Lac, off of Hickory Rd. 3 miles of hiking trails, Parsons Creek and beautiful fall foliage make Hobbs Woods a community favorite! Open most days from 6am – 10pm. Horicon National Wildlife Refuge – This 31,000-acre marsh, known as the “Everglades of the North”, lies within both Fond du Lac and Dodge County and is located off of Hwy 49. It is the largest freshwater cattail marsh in the United States, and during the very popular fall season, serves as a pit stop for hundreds of thousands of geese migrating to Canada! Open Monday-Saturday, 9:00 am – 4:00 pm (plus Sundays in October). Lakeside Park – Overlooking beautiful Lake Winnebago, Lakeside Park is the perfect spot for a fall stroll! This park boasts 400 acres complete with picnic areas, covered bridges, the infamous lighthouse, boat launch, marina, antique carousel and plenty of fall colors to enjoy! Open daily from 6am – 10pm. Kettle Moraine State Forest | Northern Unit – This incredible state park covers 30,000 acres and stretches 30 miles across Sheboygan, Fond du Lac and Washington Counties. This gorgeous area boasts hills, lakes, grasslands, forests, winding roads, camping, horse back riding and all those beautiful fall colors. State forest is open daily from 6am – 11pm. 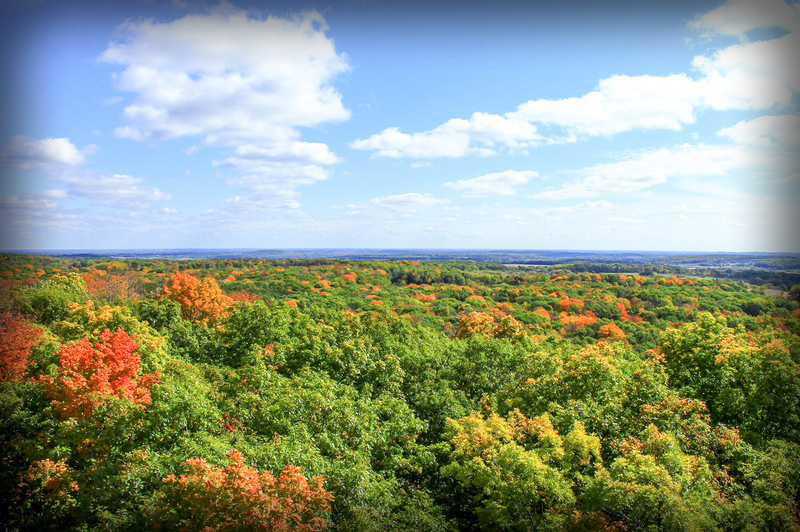 Make sure to check out Parnell Tower to see fall colors for miles & miles!!! With over 1,400 local farms, it’s no surprise that Fond du Lac County offers a large variety of fruit orchards, wineries & farms that offer plenty of fall activities & events! 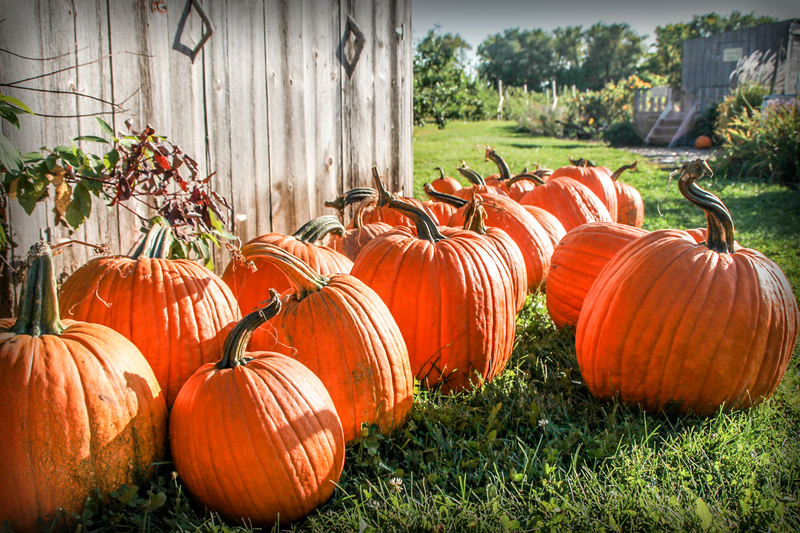 From apples to pumpkins, Fond du Lac County has you well covered with agricultural fun for the whole family! The Little Farmer Orchard & Farm Market – Located on Hwy 151 towards Malone, the Little Farmer is a local favorite, and has everything from apple picking, homemade bakery and coffee shop, hayrides, corn mazes, gift barn, rides and SO much more! Closes November 27th for the season, typically open from 8am – 6pm. Tom Dooly Orchards – Located in Waupun, off of Hwy 49, Tom Dooly Orchards grows over 20 different apple varieties each year, and sells everything apple you can imagine, including: apple cider, apple butter, apple pie, apple bread, apple strudel, apple cider donuts and don’t forget about their delicious caramel apples! They’re open Mondays 9am – 5pm, and Tuesdays-Sundays 8am – 5pm. Meuer Farm Corn Maze – The infamous 10 acre Meuer Corn Maze is open from Sept 16-Oct 31. And this year’s corn maze theme AND shape is.. Elvis Presley! On top of the 45 minute long corn maze, Meuer Farm also offers hayrides, a pick-your-own pumpkin patch, farm activity area, corn cannons, country store and a deliciously farm fresh restaurant! They are open Fridays & Saturdays from 10am-10pm (ticket sales end at 9:30pm) & Sundays from 10am until dusk. Corn maze season ends October 31st. Armstrong Apple Orchard & Winery – Located off of Cty. Rd B in Campbellsport, Armstrong Apple Orchard & Winery is a “foody” atmosphere that offers a wide variety of farm fresh products including fresh fruit, cider, jams, giant Bavarian pretzels, salsas, fudge, bakery, and of course, wine! They have wine tasting, apple sling shots, jungle gym & jump pad for the kids, wine & paint parties, live music nights and more! They’re open Tuesday through Sunday, 10-6pm. Tis the season for cooler weather, warmer clothes and fall fun for the whole family! 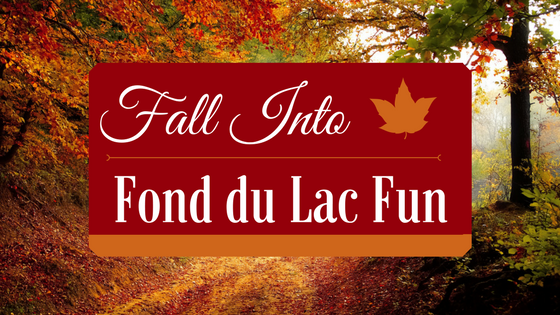 Fond du Lac County offers a wide variety of fall festivals, where you can enjoy everything from live music & entertainment to pumpkin decorating and farm fresh food! 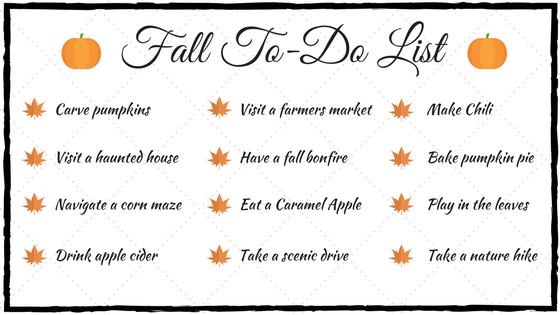 Check out a few of our favorite fall festivals below! Vir-Clar Farm Fall Fest | Sept 22nd 2pm – 6pm & Sept 23rd 9am – 3pm. This festival is full of fall fun for the whole family! Enjoy farm & milking parlor tours, face painting, chili cook off content, kiddie tractor pull, farm fresh food, pumpkin decorating and more! Located on Cty Rd K in Fond du Lac. Ages 6 and up $5 and 5 and under free. (All proceeds benefit Ag Ambassador Program and Armstong 4-H Club). Autumn Art on the Marsh | Sunday, September 24th 2017 9am – 3pm. This annual fall art & craft fair is nestled next to the beautiful Horicon Marsh! Featuring over 115 booths of handmade art and crafts, hourly door prizes, tractor raffle, pig roast, chili, dessert bar, live music & more!! Free admission & open to the public! Dundee Annual Fall Color Car & Craft Show | Saturday, October 14th 9am – 4pm. Held at Dundee Sportsmans Park, located off Hwy 67 & Hwy F in Dundee, this annual fall event features a classic car show, craft and art vendors, food, beverages & live music! Free admission plus all proceeds benefit the Dundee Sportsmans Club and the Long Lake Preservation Association! Oktoberfest | October 14th, 2017 from 5-8pm. Enjoy a German dinner and musical celebration at Knights of Columbus Hall in Fond du Lac! Tickets include live music & entertainment plus a traditional 7 course German meal including Sauerbraten, späetzel AND apple strudel!! Grab yourself a German beer from the bar and Polka the night away! Tickets are $25 per adult, $15 for children 10 & under. Tickets can be purchased at Wegner Office Supply at 15-17 Court St., Fond du Lac, WI 54935 OR at www.lifeathope.org (click the Oktoberfest link on the bottom). Ticket deadline is Monday, October 2nd. When witches go riding, and black cats are seen, the moon laughs & whispers ‘tis near Halloween’! From haunted houses to trick-or-treating, we’ve got you covered with our favorite Halloween themed attractions & events around Fond du Lac! Spooktacular by Children’s Museum of Fond du Lac | Fri, Oct 20th from 4-7pm. Come one, come all!! Children’s Museum of Fond du Lac hosts their annual Spooktacular event! Dress your whole family up for their costume contest! And experience an interactive magic show, caramel apple bar, “Monster Lab,” Halloween sensory bottles and more!! Regular admission cost is $7 per adult or child, $6 for seniors. Monster March | October 28th 10am-12pm. Costumed children and adults are invited to march down Main Street & trick-or-treat for free at participating downtown businesses and farmers market vendors! Children must be accompanied by an adult. Stop by Main Street Plaza to have your photo taken and entered into Facebook costume contest! Prizes will be awarded to best group theme, scariest costume, and cutest costume. Warriors Haunted Asylum Haunted House | Opens September 30th at 7pm. Located on Hwy W in Dotyville, Warriors Haunted Asylum is open every Friday and Saturday in October. Doors open at 7pm and tickets are sold till 10pm. Ticket price $12. Watch for details on their 1st annual coffin races! Scary Skurry 5K | Saturday, October 7th 2017. 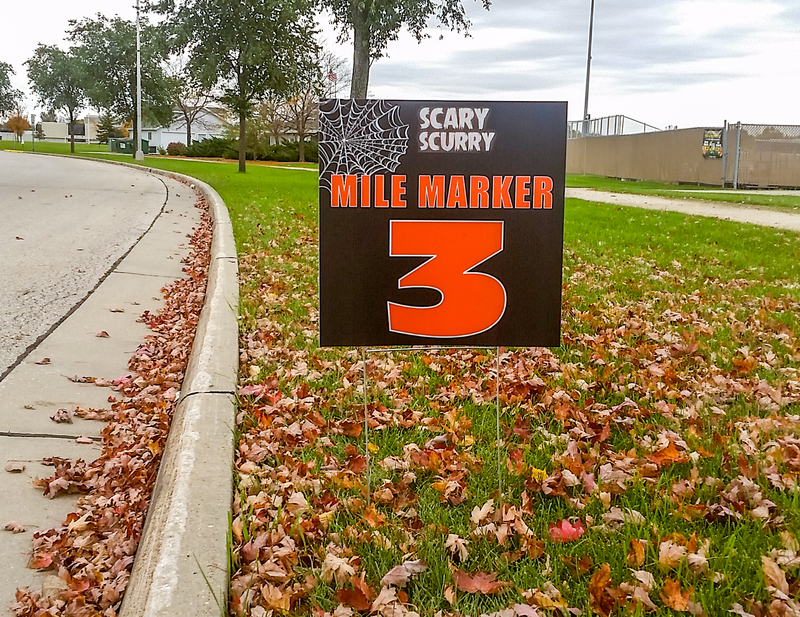 This spooky 5K Run/Walk is a Halloween costume themed, chip timed event that begins at 8:30 am with the kids races following at 10:00 am (1/3 mile) and 10:30 am (1 mile). There will be Halloween giveaways, snacks and beverages immediately following the race, awards for top runners (by age, gender and overall) and prize drawings for costumes! 5K Race – $20 by August 1st, $25 between August 1st-September 22nd, $30 after September 22nd. Kids Races – $10. Registration ends October 5! To view more fall events in your area, please visit any of the links below! Happy Fall, Ya’ll!! Next: You’re Invited to our Holiday Customer Appreciation Party! !